In the aftermath of King Robert Baratheon's death, Westeros bleeds. The scheming Lannisters control King's Landing, trying to solidify their hold on the Iron Throne in the face of assaults from Robert's brother, Stannis. In Winterfell, Robb Stark has rallied the Northmen and forged an alliance with House Frey. But as he readies his forces to march south through the riverlands, the Ironborn of House Greyjoy prepare to pillage Westeros and make their own bid for power. The A Storm of Swords Expansion offers two exciting new gaming experiences. 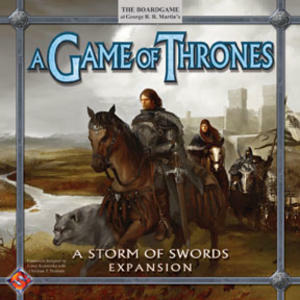 First, this expansion offers a new 4-player game, including a new board focusing on the Trident riverlands area of Westeros, new victory conditions, and a plethora of strategic options. Second, this expansion includes rules on how to incorporate the new components and options from the A Storm of Swords game into the original A Game of Thrones. • Vie for the support of Houses Arryn and Frey, as well as the help of hardened mercenaries and cold-blooded outlaws. • March powerful new Leaders into combat, and take opponents' Leaders hostage. • Play Tactics cards to make armies more mobile or gather more power. • Explore the different strategies offered by a new set of House Cards and an alternative set of Westeros Decks.